“Forever” is a song by american rock band Kiss released as the lead single from the 1989 album Hot in the Shade. It peaked at number 8 on the Billboard Hot 100 chart, making it the band’s first American Top 40 single since “I Was Made for Lovin’ You” reached number 11 in 1979. It was the band’s seventh and, to date, last Top 20 US single. It also reached number 17 on Billboard’s Hot Mainstream Rock Tracks. The song was co-written by guitarist/vocalist Paul Stanley and American singer/songwriter Michael Bolton, who was then at the peak of his commercial popularity, and with whom guitarist Bruce Kulick had played previous to Kiss. 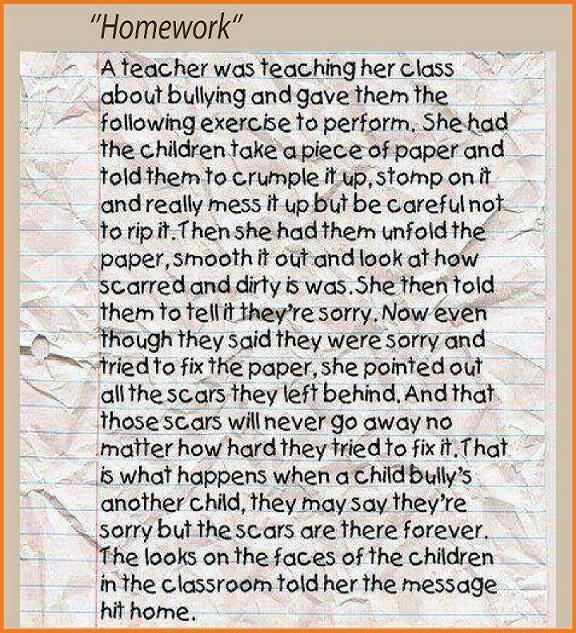 A teacher was teaching her class about bullying and gave them the following exercise to perform. She had the children take a piece of paper and told them to crumple it up, stomp on it and really mess it up it up but be careful not to rip it. Then she had them unfold the paper, smooth it out and look at how scarred and it was. Now even though they said they were sorry and tried to fix the paper, she pointed out all the scars they left behind. And that those scars will never go away no matter how hard they tried to fix it. That is what happens when a child bully’s another child, they may say they’re sorry but the scars are there forever. The looks on the faces on the children in the classroom told her the message hit home.